An ingrown nail is the result of a nail growing into the skin that surrounds it. 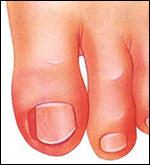 This often occurs at either edge of the big toe, but it may also occur with the little toes. Ingrown nails may be caused by improper trimming, inherited nail deformities, injuries, fungal infections, or pressure. 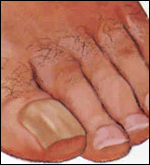 Ingrown nails may cause pain at the tip of the toe or all the way to the base of the toe. The pain is often worse while walking. 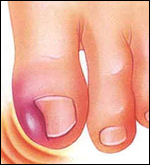 An ingrown nail may also lead to infection or inflammation. If it’s infected, you might see pus or redness. To determine the extent of your problem, the podiatrist examines and possibly palpates (presses) the painful area. If other problems are suspected, blood tests, cultures, or x-rays may be done as well. 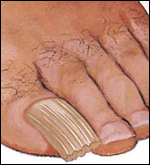 If the nail is not infected, the podiatrist may trim the corner of it to help relieve your symptoms. For a partially ingrown nail, Dr. Henry may need to remove one side of your nail back to the cuticle and treat the base of the nail. Severe infections or totally ingrown nails may require antibiotics and temporary or permanent removal of the entire nail. To lessen pain, a local anesthetic may be used in these procedures. Along with thickening, the nail may appear ridged, brittle, or yellowish. The nail may also feel painful when pressure is put on it. Since thickened nails may be symptom of an underlying medical condition, it’s important for the podiatrist to look at your medical history for possible related problems. The thickness and color of the nail are also examined carefully to determine possible infections or other conditions. If a fungal infection is present, oral or topical antifungal medications may be needed. This can help prevent ulcerations under the nail while keeping the fungus from spreading to other nails. If pain is extreme, the nail can be surgically removed. How Can I Prevent Nail Problems? Many nail problems can be prevented by wearing the right shoes and trimming your nails properly. To help avoid infection, keep your feet clean and dry. If you have diabetes, talk with the podiatrist before doing any foot self-care. To avoid possible problems, try to trim your toenails straight across without cutting down into the corners. You can smooth the ends with an emery board. Get your feet measured (your size may change as you age). Wear shoes that are supportive and roomy enough for your toes to wiggle. Look for shoes made of natural materials, such as leather, that allow your feet to breathe.